If you are unsure of what to buy and need advice look call 01344 452800 for professional help.. 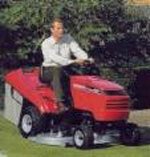 Choosing your first lawnmower or upgrading your current model is a real investment in your garden. With so many different models, makes and sizes the choice can be daunting. Our buyers' guide to lawnmowers will help you to decide which lawnmower is right for you. WHAT SIZE IS THE LAWN? 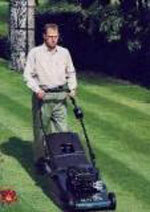 Identifying the size of your lawn will help you to choose the most suitable lawnmower for the task. You also need to think about the shape of your lawn - lawn - whether there are any slopes or inclines, awkward overhanging shrubs or trees, or water features which will need to be trimmed around. Different lawnmowers have features that will help you deal with these differing landscapes. 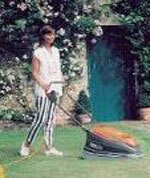 · Gives your lawn a striped effect to look like the Centre Court! · Not suitable for undulating or rough ground, or where grass is long and wet. · Available from 12" to 21"
· Available from 12" to 19"
For the larger grass areas, enjoy the satisfaction of sitting down to mow the grass!